Her presentation had already begun when I arrived due to the fact that a student was late finishing up a test. For some reason, I felt this super sense of urgency to see her. Never mind that the first time I had ever even heard of her was about 12 hours before. In hindsight, I had somehow sensed she was special. As she spoke, I was immediately drawn in by her physical beauty and how confidently she spoke. She was clearly someone who believed in herself. 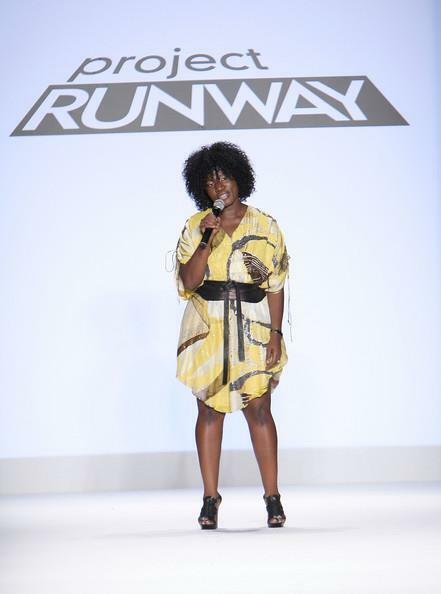 She told us about her journey from Liberia to Canada and then to fashion school. Stop there! That would have been interesting enough…but she went on to tell us about how she ended up on Project Runway. She captured the essence of the folks who attend our Think Tank Society meetings in that she said we should all encourage each other to rise up and above. She believes that we all need to work together to help one another. Since that is the exact spirit we harness in our Think Tank Society, I couldn’t help wishing some of our members could be there and that she could regularly attend our great meetings. When one of the students asked how one should find his or her way/calling/signature Korto recommended that this student spread all of his work out in front of him and look for the common thread. She said, if you look close enough at everything you create, you will see a common thread. It could become your path, your signature, your essence. Korto Momolu is on an very winding path and she clearly keeps growing. Her energy alone was inspiring enough and she wants to take everyone on her journey with her. What a generous spirit she is and I am so grateful I got to experience her—her signature, her essence, her vibe! Wow! This was one of the most inspiring reads for me in a long time! I would have LOVED to have met her and soaked up some of her inspiration and energy, LIVE! So glad you got to experience it; and thank you SO MUCH for sharing the message with us! It got through!!!! This is very inspiring!, I will look forward on this guest speaker.